Today’s world is tremendously noisy. Everyone is recurrently exposed to various kinds of high and low frequency noises that affect both our health and way of life. Common outdoor noises include traffic, aircraft, neighborhood commotion and industrial noise pollution like mills and factories, equipment and machinery. Both our home and work environments are affected by noise. At work, people are subjected to noise pollution from fans, telephones and ventilating systems. Noise pollution can also affect your health. According to the World Health Organization (WOW), noise is a fast growing public health concern. WOW reports that noise pollution can have unpleasant health effects like sleep disturbances, cardiovascular issues, psychophysiological problems, loss of hearing plus generate undesirable social behavior, aggravated responses and lower performance. Most everyone can appreciate the value of a home that is sound proof. It is common knowledge that noise pollution greatly affects a person’s peace of mind and health. But as a homeowner you can soundproof your home to protect your sanity and health. One of the leading innovative products for soundproofing your home is the Green Glue Whisper. Utilized with Green Glue Noise Proofing Compound and sealant, the Green Glue Whisper can significantly decrease noise pollution. 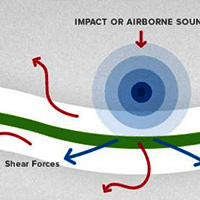 In effect, the complete system is so effective that it can lower both outside and inside noise pollution up to 90%. Green Glue Whisper clips allow you to separate two sides of a wall so that when the wall is hit by sound only one side vibrates thus blocking the noise from entering the home. The whisper clips prevent most of the sound from transmitting through to the inside. Because of their fortified design, Green Glue Whisper work far better than old fashioned decoupling methods. Green Glue Whisper Clips are designed to isolate mid to high frequencies. They are also superb at reducing impact noise. Compared to other clips they are by far superior. In addition, when utilized in conjunction with Green Glue Noise Proofing Compound and Sealant, Green Glue Whisper is extremely effective. Green Glue Whisper Clips are easy to install, requiring very little effort. All that needs to be done is to screw the clips into the wall studs or directly to the framing. The hat channel furring is then snapped into the clips and the drywall is screwed into the hat channel. However, installing the clips over drywall or other rigid surfaces may slightly reduce performance. This is why using Green Glue Noise Proofing Compound and sealant is highly recommended.